thanks for the tip- that is such a great idea! 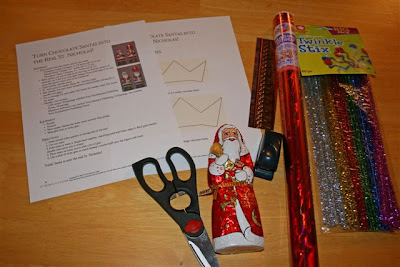 i just saw that same st. nick in the book store last night, but did not buy him because he did not look "catholic" enough= ) i wish i would've seen this post yesterday! Jessica--These are a St. Nicholaus tradition around here. I never know if I'll get to the baking so these are always ready and waiting for tea time. 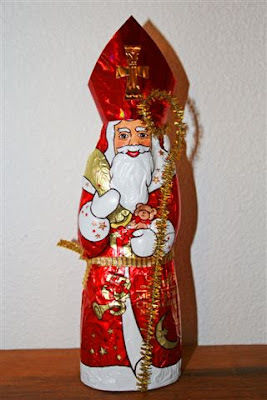 This year I found beautiful 3D Lindt chocolate Santas that were dressed very European style, which made lovely St. Nick's....hope your family enjoys. Colleen ~ Your St. Nick's sound awesome!! I am sure this will become one of our traditions as well.. It was so easy and they turn out so cute! I've wanted to try the make-over here, but haven't managed it. He turned out really cute! Jessica , What a beautiful person you are. I think of you when I think of St. Therese the Little Flower. Today, I will offer up Mass for you and your family. Jessica, you have helped me more than you know. Your path has greatly blessed us and has allowed me to continue what God has called me to do. Losing pretty much everything financially, by God's hand, I believe,and through these last few years you have kept me in so many ways from throwing in the towel. When we did not have enough money for new books, you helped me figure out ways to continue. Thank you so much for posting what you do. Your work has assisted me when I had to return to work. When we rented a house that had cockroaches crawling all over the place I seeked solace in your website. As God has allowed me to die to self and humble I believe He allowed me things such as your website as comfort and that there is HOPE.You are a joy to me and so is your family.